A year or so ago in mid 2018, I knew I would soon be coming up on a major milestone in my life. I knew I’d be coming up on that dreaded marker of having traveled 29.2 billion miles through space – also known as, “turning 50.” How does one celebrate having survived 50 full years living on a planet where both physics and the laws of nature want to kill you, every single day? It’s an incredible achievement when you stop and think about it. Fortunately, I won the genetic lottery just by being born in a time and a place where living past 50 is actually not all that unusual. But how to celebrate? I mean, sure – I could go the traditional route of buying a fire-engine red Corvette and then running off with my much-younger secretary … but that’s been done a million times already (and besides, my administrative assistant is the wrong gender for that anyway). Back in early 2018, I had started paying closer attention to my overall health and fitness. I wasn’t in the greatest place as January 1st rolled around, and I absolutely needed to get better about it. In fact, it had gotten so bad that in late 2017 when I attended my mother-in-law’s funeral I couldn’t even button the neck collar on my dress shirt so that I could wear a tie on that day for her. Honestly, that hit me like a ton of bricks – I had never weighed so much in my entire life, that I couldn’t even button buttons. So as 2018 rolled around I was already starting to make changes for myself, starting out with Intermittent Fasting. Overall, that has had some solid results for me (ask me more about it if you’re curious). Fast-forward to mid-2018, and my 49th birthday came and went … and the countdown-to-50 was really running now. As I stopped to ponder what I could do over the next 365 days which would be significant, something “improving health” related seemed like an obvious choice to focus on. But what to do? I’ve never really been an athlete, never played many sports. It’s not that I’m uncoordinated, but I just never found anything that I was good enough at, and that I enjoyed doing with others. I’ll admit to being a bit jealous of some of my other friends who regularly participate in competitive and amateur sports leagues – they are always having fun with their friends, and are helping their health out by doing so. But I never really found my way into that, despite trying to at previous points in my life. As a part of already trying to improve my health in some way in 2018 – I had taken up walking on the treadmill at home. And I do mean walking, because any time I had tried jogging at any point in previous decades, I just couldn’t do it. My shins would just immediately start radiating this intense pain, within 3-4 minutes of my starting out, and I just couldn’t continue. So I always assumed jogging was just never going to be in my future. However … one day after walking 2.5 miles on the treadmill in an hour … I thought I’d give a short jog a try. So I ramped the treadmill up to 4mph (not at all fast by running standards, but almost impossible to “walk”) and much to my surprise, I was actually able to do that for about a quarter of a mile before I started to hurt. And the hurt that I was feeling in my legs … was not nearly as bad as when I would just go out and try and run down the sidewalk. So I figured that might just be my answer – that I just needed really ridiculously long warmups before attempting to jog. Over the course of a few more “practice short-runs” (with hour-long warmup walks) in the early weeks of the summer of 2018, I found myself increasing my continuous-running time to a half mile, and with speeds getting up to 4.5mph. And most importantly – without insane levels of pain in my shins. And so that’s where 50th-birthday-milestone-goal #1 was invented – I decided that I would run a 10k on (or near) my 50th birthday, in order to celebrate. A 10k is certainly challenging, but did not seem outside of the realm of possibilities for me to build up to in 9-10 months. It would take training, practice, and dedication to be able to achieve it. And that’s still a goal right now, but now it is a part of a larger overall goal. My new and improved goal for this spring and summer is to run 50 kilometers across multiple different events throughout the year – i.e. : #50for50. 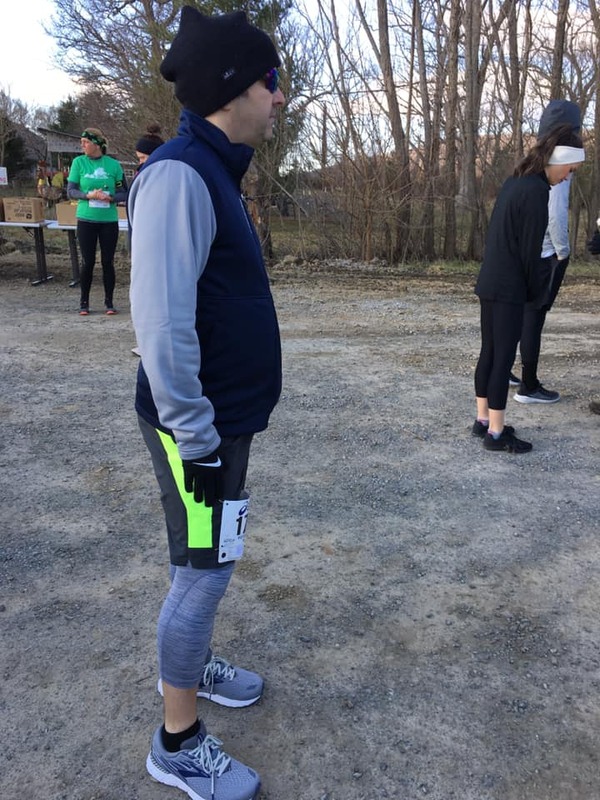 And I’m happy to say, I just completed the first 5k (3.1 miles) this past weekend in frigid 37F degree temperatures (that’s me down there in 74th place for the men), so I’m already 10% of the way to my goal for the year! I might still do that 10k that I’ve had my eye on that is just a week or two before my birthday, but if I don’t (it’s a “trail” course, which is quite different from what I’ve been practicing for) I will find other events throughout the year to get me to my 50k goal. Here are some of the events I’m either looking into, or currently signed up to run — I’d love to have any of you reading this come and join me! I haven’t seen as much of my friends and family over the past six months, as I’ve been building up towards this goal. The gym and the dreadmill are taking away time that otherwise would have been spent socializing. But it’s something I definitely want (and need) to accomplish for myself – so I’m appreciative of all of my friends who have been very understanding that I haven’t been around as much lately!